Commemorating the 30th anniversary of the victims of the 1988 Massacre of 30,000 political prisoners, mainly MEK activists. This summer marks thirty years since the massacre in Iran. In 1988, the Supreme Leader of the Iranian regime issued a fatwa ordering the execution of political prisoners. Over the course of a single summer, 30,000 people, most of them MEK members, were summarily executed by the regime. The mullahs see the MEK as a threat and have targeted the organization for decades. The Iranian regime has spent untold time, effort, and money demonizing the MEK and plotting attacks against the organization, all the while proclaiming that the MEK has no power or influence. It is clear that the regime sees the MEK as a threat to its very existence. In 1988 the regime attempted to erase this threat with a mass execution. 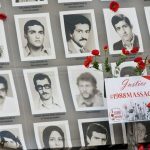 The 1988 Massacre was a tragedy and a crime against humanity. The perpetrators of this crime have never been brought to justice. Instead, they have risen through the ranks of the Iranian regime and remained unpunished for their horrific crime. The perpetrators have not gone unnamed, but they have not answered for their actions. Alireza Avaei, one of the men responsible for the mass execution of Iranian citizens has held the position of Justice Minister, an irony that would be laughable if it weren’t so disgusting. Shekar, a passionate nurse in #Tehran. She was executed at the age of 32 after enduring 7 years of imprisonment from her 15 years sentence. She has become one of the symbols of resistance under torture and innocent lives lost in the #1988massacre. The families of those who were executed continue to suffer to this day. These victims of the 1988 Massacre lost family members, were never given the chance to properly bury them, and must live with the knowledge that their killers walk free. Family members have had to listen helplessly as members of the regime bragged about their crime. The regime has not yet repeated an act as daring as the execution of tens of thousands of dissidents in a single summer, but it still routinely conducts mass executions. Human rights abuses take place under the mullahs’ regime on a daily basis. The regime targets MEK members at home and abroad as a matter of policy. In Iran, those who take to the streets to protest the clerical regime do so at grave personal risk, whether they are part of an organized resistance group or not. The consequences for speaking out against the regime are severe. Protesters may be arrested, fined, tortured, mistreated, or even executed. Even so, the Iran protests are now entering their ninth continuous month. An uprising that cannot be suppressed is a powerful weapon against tyranny. 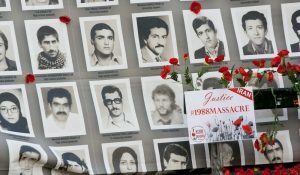 The MEK has issued a call for an international investigation into the 1988 Massacre. On Saturday, August 25th, the Iranian communities are holding a simultaneous international conference in 20 capitals and major cities in Europe and North America to discuss this call to action. Survivors of the massacre and family members of the victims will speak live to audiences around the world. The event will be broadcast on social media and on the Internet. It is imperative for anyone who values human rights to take action to seek justice for the victims of this atrocity by calling on our governments to first condemn the executions and then bring the perpetrators to justice. The United States is currently increasing its focus on Iran and has announced the formation of an “Iran Action Group.” This is an opportunity to draw attention to human rights issues in Iran that can no longer be ignored.